This entry was posted in Beaded Journal Project, Beads, Color, Creativity, freeform peyote, Jewelry, mixed media, My Studio, Nature, Photography, Stones and tagged bead embroidery, beaded cabochon, turquoise. OMG! That is gorgeous! I love the southwest & tourquoise. You did a really nice job framing it. Thanks for sharing! That is striking, Karen. You did an amazing job framing it and putting it on that fabric is perfect for the photo. Yummy! 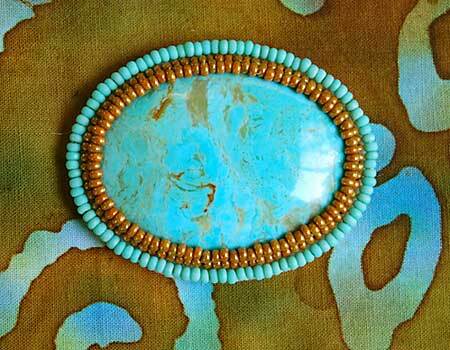 I love turquoise and copper even better than turquoise and silver. That is a very pretty cabochon, but I have to admit what first caught my eye was the fabric behind it. Is that batik? I just love the look of batik, and those colors are so striking – a perfect backdrop for that cabochon. I know what you mean, Lisa. I would love to incorporate batik fabric into my jewelry somehow because I love the look so much.